motherhood has unexpected side effects. Anne Breymann studied Visual Communication at the Academy of Arts in Kassel, where she graduated in 2005. Her films include Das zweite Experiment (1999), Liebe und Tod (2000), Himmelsstuermer (2003), and her graduation film Sproessling (2006). 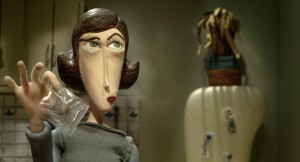 Besides directing her own films, she also works as a puppet maker and model maker for film productions.